Kevin was recently invited to join Le Moyne College’s Board of Regents. The members of the Le Moyne College Board of Regents play a crucial role in helping Le Moyne to further its mission of preparing its graduates for lives of leadership and service. Among their chief responsibilities are to raise the College’s profile in Central New York and beyond. In addition, the Regents are deeply involved in some of the College’s most important initiatives. Kevin proudly serves on the Personal & Professional Development Committee and Founders’ Day Committee. “What does it take to start a successful company? For Kevin Nickels ’13, the answer to that question is threefold – a good idea, a sound business plan, and a proven strategy to execute that plan. 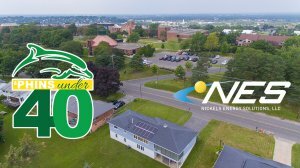 Nickels ’13 is the vice president of Nickels Energy Solutions (NES), a Liverpool, N.Y., based company that specializes in the installation of solar panels. Since founding the company with his brother, Steven, in 2015, Nickels has dedicated his professional life to field that supports a number of national priorities, including climate change mitigation, national security and economic growth. NES is growing at a time when more and more Americans are searching for environmentally friendly sources of energy. Solar power in particular is more affordable, accessible and prevalent in the U.S. than ever before. Nickels acknowledged that when NES first entered the field, it wasn’t a known entity. He and Steve had to win people over with what they consider to be the foundation of their business – “honesty and communication.” The company recently expanded its services and, in addition to solar panels, now sells and installs smart thermostats and chargers for electric vehicles.